I was looking forward to a Christmas in Wagtail. Not to be too sappy, but like the ones I remember from my childhood. I have such vivid memories of the candlelight procession to the church where we sang carols. The Sugar Maple Inn was always lavishly draped with garlands of pine, and the Christmas tree was gigantic and loaded with sparkling ornaments. It always snowed, leaving a dusting on Wagtail just like Christmas in a picture book. When I think back, I'm certain the tree wasn't that big, nor was the snow magical. I was six when we moved to California. Don't get me wrong. Christmas was lovely there. But then my parents divorced, and holidays were always a mad rush to see everyone. I had hoped those days were over. But here I am in my early thirties, and my parents are still both playing the guilt card. Mom wants me to come to California, and Dad insists I visit him in Florida. Both of them have new spouses and more children. It's not like I'm their only hope for a merry Christmas. In the end, I capitulated. I wouldn't dream of going without Trixie, my Jack Russell Terrier, and Twinkletoes, my calico kitten, so Florida won. I ashamed to admit that I'm not looking forward to driving for two days each way. I'd much rather stay in Wagtail. Fortunately, I have an excuse to come back right away. Oma, my grandma, is taking a much deserved cruise with her best friend, Rose. This will be the first time I'll be in charge of the Sugar Maple Inn by myself. I'm looking forward to it. The town of Wagtail will be throwing a big murder mystery weekend in January called Murder Most Howl. The inn is already completely booked. It will be great fun, and I can finally prove to Oma that I can handle the inn by myself! I'm off to Florida now. I wish all of you the merriest Christmas and a fabulous New Year. Maybe I'll see you at Murder Most Howl! Trixie and Twinkletoes appear to have gotten hold of two copies of the book that they'd like to give away. Leave a comment here with your email address so they can get your mailing address if you win one! The drawing closes at 5PM eastern time on the 21st. Good luck! This is on my wish list! Thanks for the chance! I love the cover of this one and look forward to the book. I would love to win this book because it looks so good! Thank you for a chance to get it. I love the Paws and Claws Mysteries mystery series, and the cover art is adorable! Thank you got the giveaway. The cover is amazing. Thanks for the chance to win the amazing book to go along with the cover. Wagtail sounds like just the right place for me to spend a few hours catching up with the crew (four-footed included) at the Inn. Thanks for the update and a chance to win. I really should be wrapping and not reading!!!! Thank you Twinkletoes and Trixie! Thank you Trixie and Twinkletoes for finding these books ... the Paws and Claws Mysteries sound delightful!! I'd love to be able to add a copy of I'd Rather Stay Home to my bookshelf. Trixie and Twinkletoes, PLEASE pick me to win!! This is on my to be read soon list! You are a good writer Krista! Happy holidays to you and your family both 2 legged and 4 legged! I'd rather stay home, too! Thanks for the giveaway. Home is the place to be for the holidays. Thanks for the contest. Love the cover of this book. I can't wait to read it!! Merry Christmas!! Home and family are what the holidays are all about for me. Thanks for the chance to win a copy of the book. Thanks for the chance to win this book, Trixie and Twinkletoes! Della at deepotter@peoplepc.com LOVE!!!!! Cozy titles. Punny is just too mild a word. Have not had the pleasure of visiting Wagtail yet. But would love to do so. And to meet Twinkletoes and Trixie. Does one or both get to sleep with the guests? I'll be spending Christmas with my 3 brothers and 2 nieces in my home town. Love the title of the book. Thank you for the chance to win this book. pgenest57@aol.com Merry Christmas!! I enjoy this series so much. Love the cover! Can't wait to read the book. Merry Christmas!!! One on my TBR list! :) Merry Christmas! Recipes and pets in a mystery! That's a great combination. Love the cover--so cute! Have a very Merry Christmas, Happy Holiday and a Blessed Yule! Love rescues. Especially dogs. Love the sound of the book! Merry Christmas. This is a great series. But then, I enjoy everything written by Krista Davis! Any good tips for driving with pets? Great cover and I'm sure the book is as great as the cover. Would really like to read. Can't wait to read this one! Love the cover, too! Thanks for the giveaway. I'd love to win a copy. Big fan of Krista Davis books! I always make sure my local library orders a copy. I'd love to win a copy! I would love this! Thank you!! This is an amazing series, a super book and I want to move to Wagtail!! I love your series! Would love to win. Have a very Merry Christmas! I loved visiting Wagtail in Murder Most Howl. I loved all of the snow! And the story was great, too! You are a winner! Please email your mailing address to me at Krista at KristaDavis dot com. Thanks for the giveaway. This is on my wish list and one of my favorite animal series. 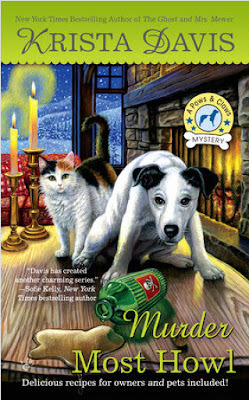 The cover on Krista's book, Murder Most Howl, is adorable. I would love the opportunity to read this book. I read and really enjoyed the first book in the series and plan on reading the rest. Thanks for this giveaway and a Merry Christmas to you. I enjoy cozies with animals in them. Haven't tried any in this series.